Ceva Indonesia is proud to announce that its C.H.I.C.K Program (Ceva Hatchery Immunisation Control Keys) is now recognized by Bureau Veritas, a global leader in testing, inspection and certification. 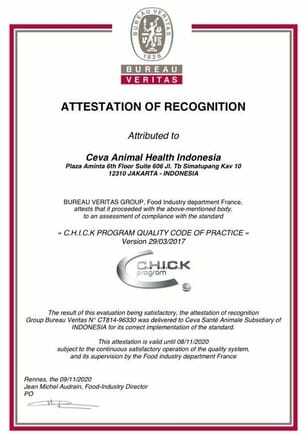 On last December 17, 2017 Ceva Indonesia officially get its Attestation of Recognition for C.H.I.C.K program. Through the several processes of evaluation and documentation reviewed by Bureau Veritas, Ceva Indonesia successfully get the quality stamp and compliance to the standard which is today the C.H.I.C.K Program Quality Code of Practice. The ceremony award was held during CHICK DAY 2018 on March 7th, 2018. CHICK DAY is the annual big event attended by around 200 hatchery and broiler Ceva Indonesia customers every year. The ceremony was marked by giving a symbolic Attestation of Recognition by the representative of Bureau Veritas Indonesia, Ms. Widiyowati Suryaningtiyas (Business Development Manager) to VSE team Ceva Indonesia. Continued by the opening of totem as an official symbol for ceremony. By having the ceremony in front of 200 customers, Ceva Indonesia show its leadership in hatchery segment and give the strength image of CHICK program itself. “With this recognition, our clients can be more confident that Ceva Indonesia team is dedicated to maintaining the highest efficiency and responsiveness in achieving the ultimate goal – having all birds well vaccinated before being sent to farms for guaranteed customer satisfaction”, said Edy Purwoko, Country Manager Ceva Animal Health Indonesia. Please visit Ceva Indonesia for more news update.